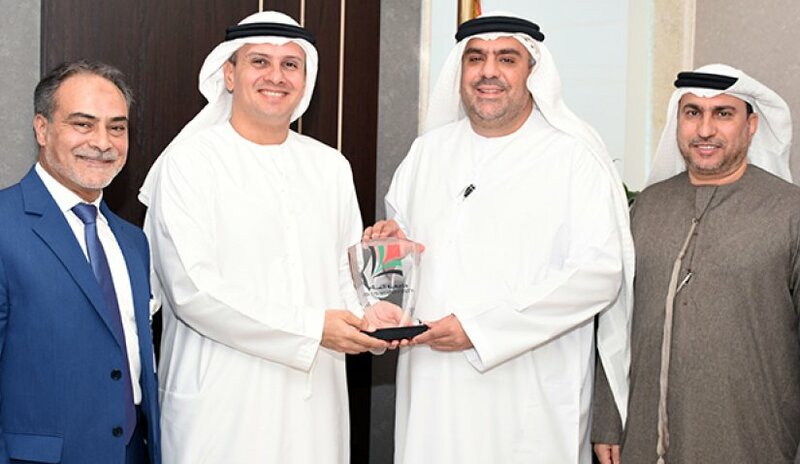 Chancellor, Dr. Noor Atatreh, discussed with the Undersecretary of the Ministry of Health, Dr. Mohammed Salim Al Ulama a possible partnership between Al Falah University (AFU) and Ministry of Health. Beside Dr. Atatreh and Dr. Al Ulama, Prof. Abdelhafid Belarbi, President of Al Falah University and Dr. Issa El Mansouri, Director of the Office of the Undersecretary and Director of the Office of International Health Relations were also in attendance during the meeting. Dr. Atatreh stated that AFU aims at creating a strong complementarity partnership with the Ministry of Health. Its common goal is to improve the quality of health services and to upgrade medical education according to the latest academic programs in line with the vision of the UAE. For his part, the Undersecretary of the Ministry of Health, Dr. Al Ulama welcomed the possibility of cooperation with AFU to contribute to the advancement of medical services and development. At the end of the meeting, Dr. Al Ulama pointed to the possibility of the Ministry's cooperation to provide training opportunities for students in the medical centers of the Ministry of Health as well as the possibility of providing permanent employment opportunities for university graduates from various medical specialties.